What exactly is the puzzle? There is a famous puzzle in mathematics and physics courses. It asks, "Why does a mirror reverse left and right, but not up and down?" It gives many people pause for thought, and if you don't want to be told the answer, skip the next two paragraphs. The answer hinges on what we consider a suitable way to project ourselves onto our mirror images. Our first reaction is that by walking forward a few steps and then spinning' around on our heels, we could step into the shoes of "that person" there in the mirror-forgetting that the heart, appendix, and so forth of "that person" are on the wrong side. On a gross anatomical level, that image is actually of a nonperson. Microscopically, the situation is even worse. The DNA molecules coil the wrong way, and the mirror-"person" could no more mate with a real person than could a nosrep! But wait-you can get your heart to stay on the proper side if, instead, you flip yourself head over heels, as if swinging over a waist-high horizontal bar in front of you. Now your heart is on the same side as the mirror-person's heart-but your feet and head are in the wrong places, and your stomach, although at approximately the right height, is upsidedown. 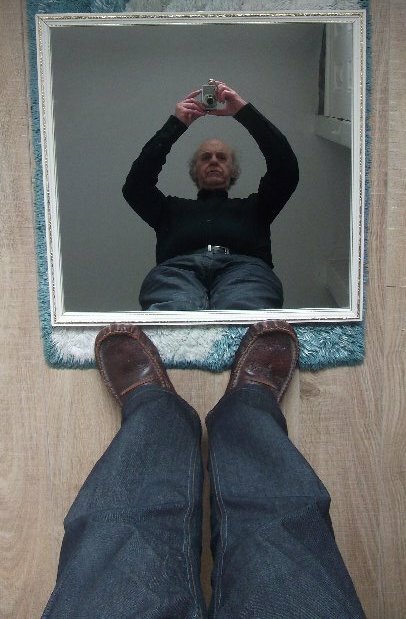 So it seems a mirror can be perceived as reversing up and down, provided you're willing to map yourself onto a creature whose feet are above its head. It all depends on the ways that you are willing to slip yourself onto another entity. You have a choice of twirling around a horizontal or a vertical bar, and getting the heart right but not the head and feet, or getting the head and feet right but not the heart. It's simply that, because of the external vertical symmetry of the human body, the vertical self-twirling yields a more plausible-seeming you-to-image mapping. But mirrors intrinsically don't care which way you interpret what they do. And in fact, all they really reverse is back and front! Go to Chapter 24 and search for "Reflections". The well known psychologist and vision scientist Richard Gregory (who discovered and analysed many fascinating visual illusions, and founded the Bristol Exploratory, among other things), wrote a short review of The Mind's I in New Scientist December 1981, available online here. In column 4 he criticises Hofstadter for not noticing that the left/right rotation of text in a mirror occurs because the text has been rotated about its vertical axis to face the mirror "giving left right reversal" whereas "twiddling" text around its horizontal axis gives up-down and not right-left reversal, adding "This has nothing whatever to do with mental mapping as Hofstadter claims it has on page 404". It is not clear whether he interpreted Hofstadter's analysis correctly. However, there is a very simple and obvious fact that appears not to have been noticed by hundreds (thousands?) of people who worry about, or publish papers about, the mirror puzzle. If, instead of thinking about real or imagined rotations of the viewer, or real or imagined head-stands by the viewer, you just put a mirror on the floor and stand next to it and look down, you'll find yourself flipped upside down in the mirror. 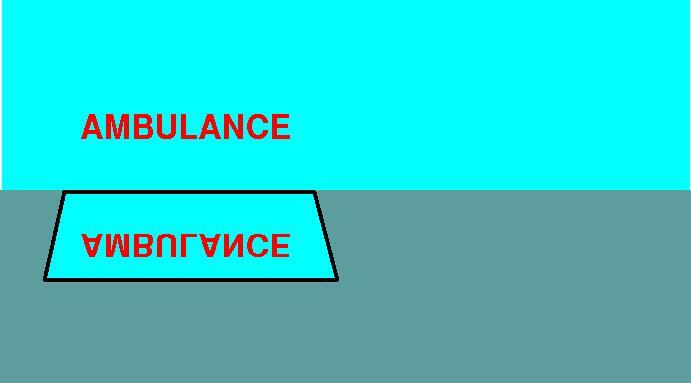 Moreover the upside down person, will have front and back facing the same way as your front and back, unlike the person reflected in the original vertical mirror. Not flipped front-back any more?? The same happens if you attach a mirror to a ceiling, so that it is horizontal and facing down. There is a restaurant in Vienna (or was when A.S. last visited over 20 years ago) where the walls and some of the ceilings are covered in mirrors, including the ceiling of the men's toilet above the urinals, producing a somewhat disconcerting anti-gravity effect for anyone looking up! So, to get the vertical flip, instead of rotating yourself, or imagining rotating yourself, just rotate the mirror through 90 degrees until it is horizontal, facing down from above, or facing up from below the viewer. Note that if a mirror is not parallel to or perpendicular to a person's long axis, then the reflection of the person will not be parallel to the person. 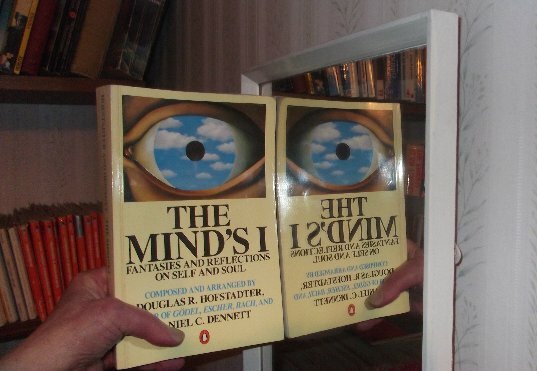 However, in all cases Hofstadter's point about asymmetric body parts not being congruent with their mirror images is correct. E.g. in the reflection, your left hand is congruent with your right hand outside the reflection (and vice versa). That is independent of where the mirror is and where you are. This is related to the suggestion explained in the discussion headed "What a mirror really does" below. 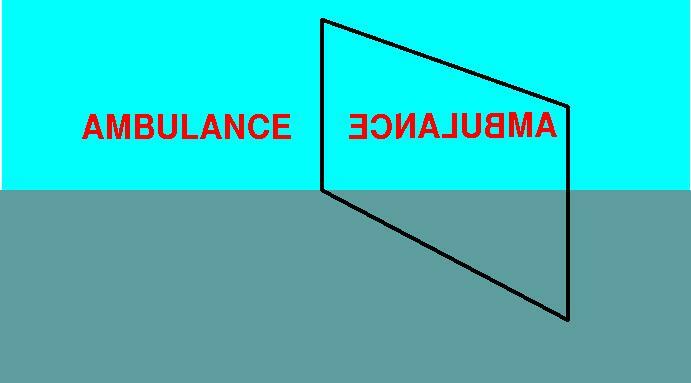 In the UK, and probably many other countries, an ambulance typically has the word "Ambulance", or local equivalent, displayed on the front in reverse, so that car drivers will be able to read it correctly in their rear-view mirrors. 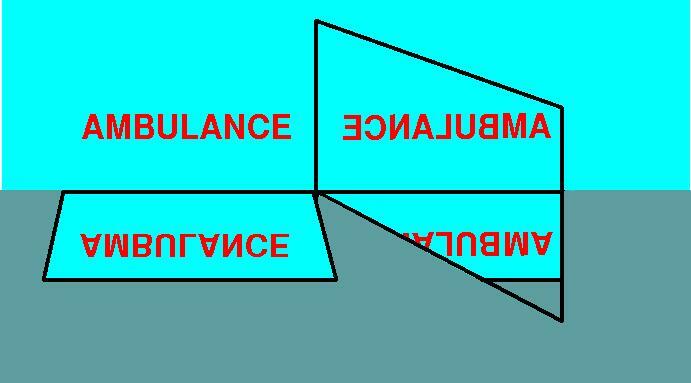 Here's the word "Ambulance" with no mirror to mess it around. The comparison is perhaps clearest with both mirrors present simultaneously. perpendicular to the wall, with the view-point changed. 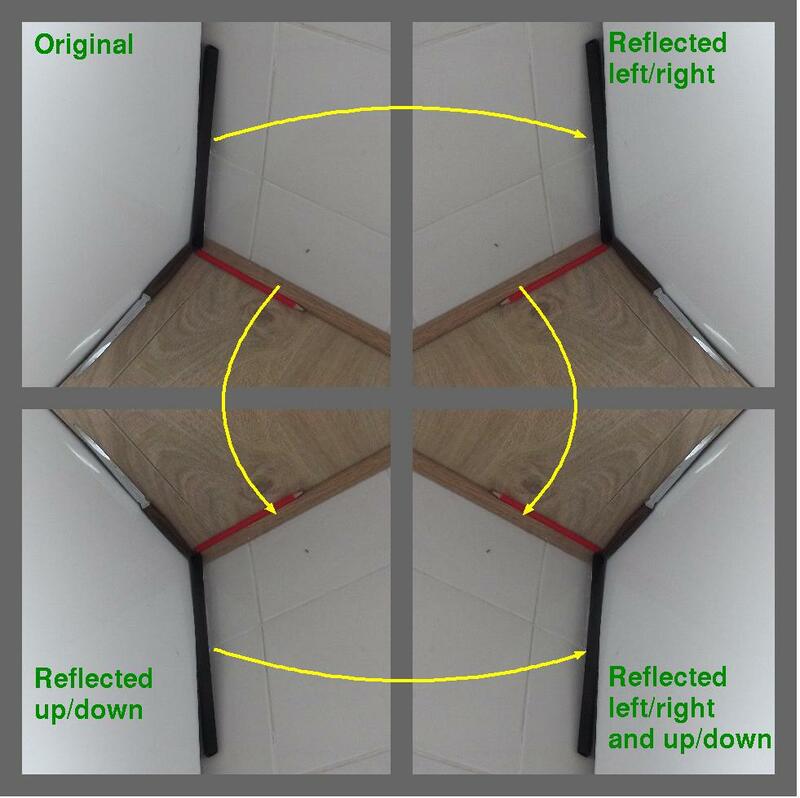 The top-left square below is a photograph of a 3-D corner of a room, showing portions of the floor and two walls, with three different objects indicating three different (orthogonal) directions from the corner. The remaining squares have three more versions of the same picture, with left and right reflected, up and down reflected, and both left/right and up/down reflected, as indicated. Each of the four pictures could be an original picture of a 3-D configuration. Without the labels provided you could not tell which of the four is the original, since the objects shown could be stuck to the surfaces, and therefore information about gravity cannot be used to distinguish the pictures that have been reflected up/down. NOTE: all the reflections are reversible. E.g. the top right scene if reflected horizontally becomes the top left scene. However, two scenes depicted in the same row or the same column are, like a left and right hand, incapable of being superimposed (even after rotations). They differ by one reflection. The scenes that differ by two reflections, e.g. top left and bottom right, or top right and bottom left, can be superimposed, like two left hands, or two right hands. There is a delightful and very popular Youtube video (Physics Girl, presented by Meg Chetwood), demonstrating what seems to be the theory proposed by Richard Gregory, and emphasising the fact that humans have left-right symmetry but not top bottom symmetry. The video is misleading in one important respect. What a mirror does (as opposed to how we describe what it does) is entirely independent of how the object reflected in the mirror has been presented. 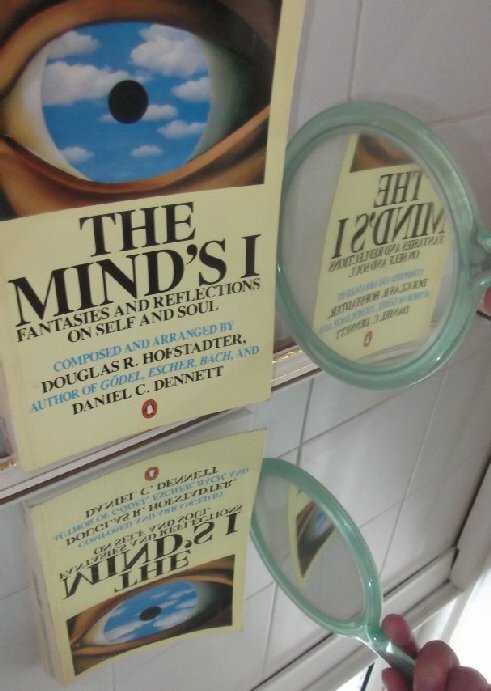 The actual transformation produced by a mirror depends only on the orientation of the mirror, though how we think about it may depend on how we describe ourselves, e.g. as having a top and a bottom, a left side and a right side, a front and a back. If the mirror is tilted at 45 degrees to a person's vertical axis it will reflect a vertical person as a horizontal one, neither parallel to nor perpendicular to the mirror. Physics Girl's demonstration is excellent at debunking one straightforward source of confusion. Mirrors do not reverse side-to-side any more than they reverse up-and-down. But it doesn't go any way towards addressing a deeper puzzle about mirrors. This puzzle is independent of how the thing to be reflected in the mirror is presented (right way up, upside down, etc.) It concerns instead the actual transformation produced by a mirror. And solving it is not just a matter of debunking it; the solution turns out to require drawing both on facts about the nature of space and on facts about the environment that human beings evolved in. "Why do mirrors reverse left and right but not up and down?" "Why do mirrors reverse side-to-side but not up-and-down?" The answer, as a little reflection (or the video from the previous section) clearly shows, is that the question is misconceived. Mirrors do not reverse side-to-side and it's a straightforward mistake to think that they do. If I stand facing a mirror with a banana on one side, the image of the banana in the mirror will be on the same side of the vertical plane down the centre of the mirror as the real banana is. "Why do mirrors reverse left-handedness and right-handedness but not up and down?" This question is not misconceived and is not resolved by the video. The phenomenon that it highlights is a familiar one. Text reflected in a mirror is hard to read: "p" becomes "q", and vice versa. If I stand in front of the mirror holding a banana in my left hand, I will be presented with an image as of somebody holding a banana in their right hand. If I catch a glimpse of someone writing with their left hand in a mirror, without realizing I am watching them via a mirror, I will incorrectly judge them to be right-handed. So why is it that mirrors reverse left-handedness and right-handedness but not up and down? To answer that question, we need to think a bit more about what transformation a mirror really performs. Mirrors do not flip things around. They turn things inside out. All the surfaces visible from the perspective of the mirror's reflective surface form a large hollow container with a very complex shape. In producing the reflection, the mirror turns that container inside out, something like a sock being pulled inside out, except that a real sock may have different colours and textures on the inside and the outside, whereas the imaginary sock turned inside out by the mirror has exactly the same visible features on the inside as on the outside, which becomes the inside after the reversal. This explains why the reflection of a left hand is incongruent with the left hand, but congruent with the right hand. A left-hand glove turned inside out fits on a right hand, and vice versa. Why do mirrors flip left-handedness and right-handedness but not up-handedness and down-handedness? Why do we associate what is flipped by a mirror with the side-to-side direction rather than the up-and-down direction? Our sides are so similar that we needed an arbitrary convention to label them; but no arbitrary convention is needed to label our top and bottom ends. Understanding why this is the correct solution will take a few more sections. Before attacking the puzzle head-on, we need to say something a little more general about the transformation that results from turning inside-out, the transformation that relates left-handed and right-handed gloves, the transformation between the objects in the spatial scene presented by the mirror and the objects which cast those reflections. This transformation is known as parity, and the property it reverses is known as chirality. I'm related to my mirror image by the parity transformation; I and the image have opposite chirality. We are chiral opposites of one another, also called enantiomorphs. Three-dimensional space (or at least regions of it that are accessible for us) constitute what mathematicians call an orientable surface. On an orientable surface, a consistent notion of clockwise rotation is definable in a continuous way over all points. This property of a three-dimensional space is provably equivalent to it being impossible to move a left glove around along any path (without turning it inside out) to bring it into perfect congruence with a right-handed glove. So, in our three-dimensional space the chirality of an object is preserved no matter how much it is moved around. In fact, chirality is preserved no matter how much an object is moved around or stretched or squeezed in any direction. Some objects -- those which have at least one axis of rotational symmetry -- can be brought into congruence with their chiral opposites. A sphere of uniform colour, for example, looks just the same in a mirror. And a cylinder could also be brought into congruence with its mirror image. These objects are achiral. Most objects, though, do not have any axes of rotational symmetry. Even cylindrical or spherical objects, if their surface is marked with a design with no non-trivial rotational asymmetries (like an 'L') can be distinguished from their chiral opposites. They are chiral. Why do we associate chirality with the side-to-side direction rather than the up-and-down direction? The answer to this question is not about mirrors, or about the mathematics of chirality, or about anything so abstract. It's about the environment that humans evolved in, and the physiology and form of life that we adopted in response to this environment. We did not need the concept of chirality to operate in the environments in which we evolved. However, we did need to be able to distinguish one of our sides from the other. For this, we developed arbitrary labels: 'left' and 'right'. Given the symmetries of a human body, this one arbitrary labelling then allowed us to describe all facts about relative orientation, including distinguishing between chiral opposites. Hands are the most familiar pairs of chiral opposites; but of course feet, ears, and even eyes also qualify. The reason these pairs of body parts are chiral opposites, of course, relates to our approximate plane of symmetry, which runs vertically down through our body and matches one side to the other. At least for most people, their external appearance viewed from different sides has much more in common than their external appearance viewed from the top vs. the bottom, or from the front vs. the back. This gives us an easy way to distinguish between front and back, and top and bottom, which we lack with respect to side-to-side. Your front has the eyes on; the top has the hair on; the bottom has the feet on. If as an evolving human you want to tell a friend from which side of them the tiger is approaching, you can say 'face-side' or 'hair-side', or the equivalent in your developing language. But you can't say 'hand-side' -- your friend has two hands, and will not know to which one of them you mean to refer. So arbitrary labels -- left and right -- will have been needed early on for practical purposes. The side-to-side axis is where an arbitrary label is useful. If I want to tell someone in a 3d maze to go forwards, I just say 'forwards'. To make them go down a ladder, I just say 'down'. But if I want them to turn one way rather than another, I need to have some (arbitrary) labelling system. So here we need terms like 'left' and 'right'. If humans had not had the (approximate) symmetry we do have, and instead always had a big blue mark on the hand that we now call the left hand, we could, instead of 'left side' and 'right side' have talked about the 'blue side' and the 'non-blue side', or something like that. Supplementing the directional axes up/down, side/side, forward/backwards, an agreed distinction between left and right allows us to fully characterize the shapes of things including their chirality. Since one arbitrary choice is enough to achieve full expressive adequacy with respect to orientations, there is no need for any other contrastive pairs to be associated with any other axis. This resolves the last part of our puzzle. How contingent is our understanding of the difference between left and right, and its relation to chirality? The following parable is an attempt to answer this question. Imagine some creatures that lack any distinguished sense of up and down, as opposed to side-to-side, and who move around freely in all three dimensions. For us, orientation in the horizontal plane is not easily detectable, unless we have a compass or can see the sun as a reference point, or some well known landmark that looks different from different directions. But we can easily detect which direction is up and which is down, using gravity (at least at normal locations on earth). Our imagined creatures, lacking this ability, nevertheless have a clear sense of a distinction between the forwards and backwards directions (we assume for simplicity that their direction of perception coincides with their habitual direction of motion), but there would for them be no privileged horizontal plane. Accordingly, where we face a two-dimensional problem of orienting ourselves in the horizontal plane that we ordinarily occupy, they would face a three-dimensional problem of orienting themselves in space. Our creatures would still need to describe the difference between a left glove and a right glove. They would do it not via an arbitrary choice of orientation in the side-by-side axis, since they have no such axis but via a choice of direction of roll: counter-clockwise as opposed to clockwise rotation in their field of view. A glove is a right glove if it fits the right hand, namely the hand for which the perceived direction of rotation from thumb through fingers is clockwise when held with palm facing away from the viewpoint. When you were small, and learning how to tell the time on an analogue clock face, you learned the distinction between these two directions. (Perhaps you learned it earlier still.) In doing so, you probably remembered it via the hand moving from left to right as it goes over the top, then from right to left as it passes below. But the creatures in our less restricted environment have no privileged sense of 'above' or 'below' that distinguishes either term from 'to the side'; so they would have to remember it without reducing it to a combination of a stipulated left-right distinction and a known up-down distinction. If a clock could talk, it would not say that mirrors flip left and right; it would say that mirrors flip clockwise and anticlockwise. Two communities of creatures may be able to share information about which direction of rotation in their visual field they call "clockwise" if they are located where they can perceive each other, or if they can send each other labelled 3-D structures, or if they both perceive the same asymmetric portion of the universe, and can communicate about it. We are not assuming that there is a general solution to this problem. The discussion of 'left' vs 'right' begins at 32mins. 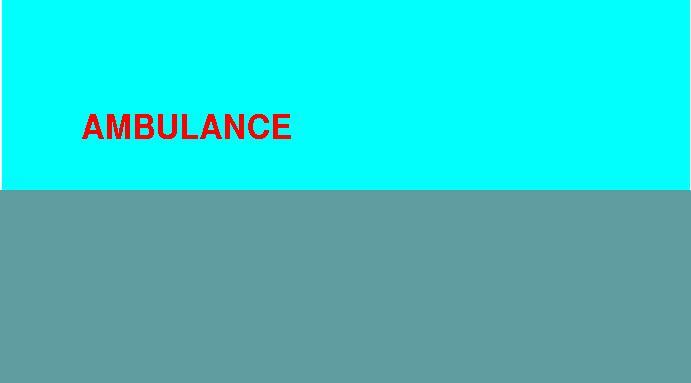 Even the ability to send televised images does not guarantee success, unless there is a way to ensure that received images are not displayed reflected or inverted. The mirror problem was mentioned along with a collection of other examples on which misleading claims are frequently made, e.g. about binocular rivalry, and ambiguous figures, in this 'Usenet' discussion (in the Psyche-D group) in 1997. A glove is a right glove if it fits the right hand, namely the hand for which the perceived direction of rotation from thumb through fingers is clockwise when held with finger tips pointing forward, away from the viewer, and the hand is held with palm facing away from the viewpoint. 2 Jun 2015: added reference to Scientific American discussion and Feynman's lecture on symmetry. 30 May 2015: made specification of right hands of creatures in the parable more precise. 10 Mar 2015: pictures improved slightly, and some text improved.